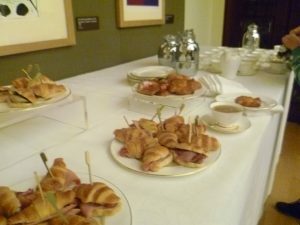 I’m always delighted to be invited to a Bloggers’ Breakfast at the Queen’s Gallery; I know I’ll be in for a treat – and that’s not including the delicious coffee and croissants. Their new exhibition, Portrait of the Artist, showcases 150 portraits from the Royal Collection, and the range is much wider than you’d expect. 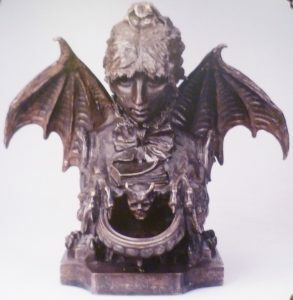 Not only are there the greats: Rubens, for example, but also humbler artists, like Paul Sandby, whom I’ve long admired; the photographer, Herbert Ponting – ditto; and the decidedly bizarre, like the French tragedienne Sarah Bernhardt’s large bronze inkwell in the form of herself as a harpy-like creature with bat’s wings, clawed feet clutching the inkwell, and with her own head. In this post, I have chosen to look mainly at the more unexpected exhibits. I had had no idea that Sarah Bernhardt was an artist and sculptor as well as a great actress, but from a photograph next to the inkwell, it’s clear that she wanted to be seen as an artist. Her special artiste’s costume comprises a white satin trouser suit, with a corsage of dark flowers on the left lapel (! ), her palette is in her left hand and her right hand holds a brush poised to touch up the painting of an angel on the easel in front of her. Her hair is piled up in classic knot on top of her head with a riot of ringlets tumbling down. We may laugh – and I did – but there were plenty of other portraits showing artists as they wanted to be seen. 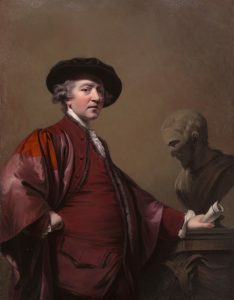 One was by Sir Joshua Reynolds, the first President of the Royal Academy, who spent his life trying to increase the status of the artist – and, doubtless, their pay, too. Here, he stands, resplendent in plum-coloured silk, his left hand, holding a scroll, rests on the plinth of a bust of some classical figure, and his right hand curls on his hip. He wears an expensive black velvet hat, a hint of lace peeps from his neck and wrists, and he has developed a rich man’s embonpoint. This man has made it – and he wants the viewer to know it. 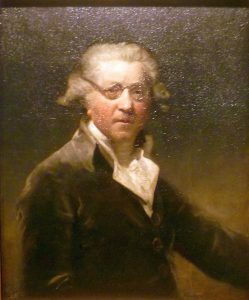 However, there is a much later portrait of Sir Joshua, from 1788, which tells a different story. He is bare-headed, save for a grey wig, and he wears a dark coat without the swathes of silk – though his neck ruffles are in evidence. He is thinner and he hasn’t aged particularly well. The most noticeable thing is his ‘wig spectacles’; these don’t hook over the ears like modern glasses, their long arms hook round the wig with ribbons at the back to hold them in place. Sir Joshua is going blind, and we feel for him. In his later years, he experimented with paints, and the crackled surface is evidence of the instability of some of the materials he used. The exhibition also shows Artists at Work. What I liked about this section was that it wasn’t just about famous artists painting each other, there are also artists painting ordinary people, as does the water-colourist, Paul Sandby (1725/6 – 1809). What I love about his work is that he paints people going about their everyday business; gardeners with wheelbarrows; families out for a walk with children and dogs; as well as giving us a glimpse into what was going on at the time. For example, he paints various temporary camps during the Napoleonic wars – similar to the militia camp at Meryton in Jane Austen’s Pride and Prejudice. This exhibition shows his Portrait of an Artist from 1765-70. 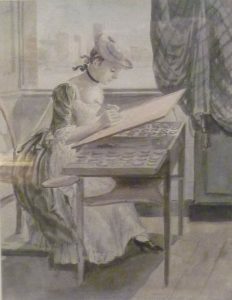 We see a young lady, possibly his pupil, Rhoda Delaval, seated at a well-appointed artist’s table, her hand holding the brush or pencil is poised over the paper, concentrating on her work. I like it for its naturalness. Not only is she a diligent pupil; he is obviously a good teacher. 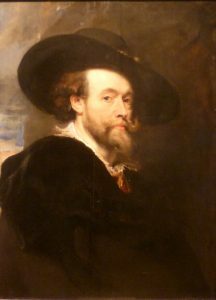 The portraits the curators have chosen often have a story behind them, like Rubens’ self-portrait from 1623. The story goes that he got an English commission for a painting to be called The Lion Hunt. If he’d checked properly he’d have realized that it was for the Prince of Wales (later Charles I). But he didn’t check; instead, he gave it to his assistants to do and, in due course, The Lion Hunt was shipped off to England. The prince was not impressed and promptly returned it. Rubens was, naturally, embarrassed, and, two years later, he sent the prince this self-portrait. It represents the forty-five-year-old artist at the height of his powers, and at his most self-confident. His splendid hat obviously makes a statement about his position in the world, as does his luxuriant moustache. The curator told us that Rubens suffered from premature baldness which the hat hid – rather effectively, I think. Charles obviously admired Rubens’ self-portrait because he kept it in the Breakfast Chamber at Whitehall, alongside self-portraits by Van Dyke and Daniel Mytens. 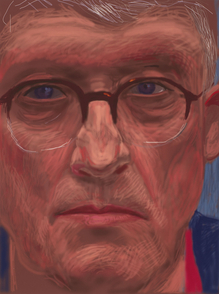 The most recent painting in the exhibition is one David Hockney donated in 2012 when he was appointed to the Order of Merit (giving a self-portrait is traditional for OM artists). He chose to give this iPad drawing of himself staring unflinchingly at the viewer, in a unique print. I also enjoyed the serendipity of coming across a self-portrait of someone I admired but hadn’t expected to see in the Queen’s Gallery. It was a photograph of the superb travel photographer, Herbert Ponting (1870-1935), dating from 1911. He took the photograph with his new cinematographic camera and it is, in fact, a ‘selfie’. Captain Robert Falcon Scott had invited Ponting to join his second Terra Nova expedition to the South Pole and Ponting was eager to accept. 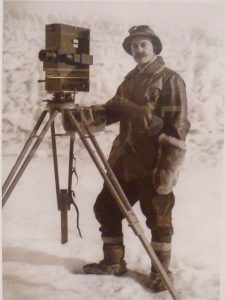 He knew it would be a huge technical challenge to produce photographs and film in the icy conditions. That first year, he took around 2000 glass plate negatives, as well as film footage, and spent the winter of 1911 developing them. They are still some of the most compelling and moving photographs in the history of Polar exploration. My mother was an admirer of Captain Scott and I was brought up knowing the story of their race for the South Pole. I have a copy of Ponting’s own book The Great White South and this picture is the frontispiece. I was thrilled to see it in the Queen’s Gallery so unexpectedly. As you can see, the choice of portraits of artists in Portrait of the Artist is very wide and there is something for everyone – and be prepared for surprises, too. Thoroughly recommended. All other photos taken by Elizabeth Hawksley. It is! And there are a lot of broodingly romantic artists’ portraits, as well! Fascinating. I should love to see the one of Sarah Bernhardt in her painting gear! I didn’t know she painted either, so fascinating to hear that. Thank you for your comment, Elizabeth. All the objects in the exhibition come from the Royal Collection, so, if you go to http://www.royalcollection.org.uk and enter Sarah Bernhardt, you should be able to find the photo of Sarah Bernhardt in her white suit, paintbrush in hand. Got it. Wonderful! Saved to Pinterest, thank you. Thank you so much, Elizabeth. I’m delighted you enjoyed it.